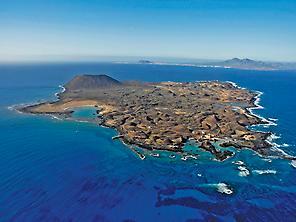 Fuerteventura, one of the seven Canary Islands, is a paradise for anyone who loves water sports. Windsurfers can make the most of the outstanding waves and wind conditions. Scuba-divers will also be able to explore spectacular sea beds. And if you're the type who loves spending days on end fishing at sea, you'll have the privilege of taking part in a marlin fishing expedition. Take your pick. Fuerteventura has 340 kilometres of coastline with beaches to suit everyone. Long beaches with white or black sand, unspoilt coves, vast expanses of sand dunes… And all lapped by crystal clear waters which enable you to see the sea bottom while you swim. Good examples are the beaches of Morro Jable, Costa Calma, Caleta de Fuste, or secluded spots on the Isla de Lobos just a couple of a kilometres off the coast of Fuerteventura, which can be visited by frequent boat trips. In Fuerteventura, two sports stand out far above the rest: windsurfing and scuba-diving. Its coastline is known by international windsurfers throughout the world thanks to its winds and waves, and the island has become established as a key venue on the World Cup circuit, held on beaches such as Sotavento. The crystal clear waters of Fuerteventura make this the ideal place for scuba-diving, with no need to dive deep, as you'll find highly-coloured fish practically up to the seashore. And you don't have to worry about bringing your own kit, as there are companies on the island which will provide you with everything you need. Other options for having a great time with sport include sailing, waterskiing and fishing. For example, the coast of Fuerteventura is well known to fans of deep-sea sports fishing thanks to the presence of the marlin (a member of the swordfish family). Fishing for this species is a thrilling experience which you can enjoy in Fuerteventura accompanied by professional fishermen. The fish puts up a very fierce fight, which guarantees the maximum adrenaline rush to be had from a fishing experience. 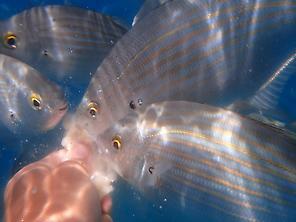 What's more, after the thrill of the catch, the fish is then returned alive to the sea.